Greg Angevine is the founder of Cube Cities and with his innovative team he has made some unique featured cities which are different from the normal thoughts. He has spent a lot of years in his career to find some idea from some of the largest and most elaborately detailed cities all over the world. From his survey over this various kind of cities he has made finally very useful, floor-level visualizations for the three-dimensional industry and it is full of uniqueness. This article will throw the light on Greg’s innovative ideas and works. About Cube Cities: It is the name of the company, given by Greg and it was founded in the year 2010 worked on creating and expanding a floor-level imagination platform which is reflects the transparency in the real estate markets. 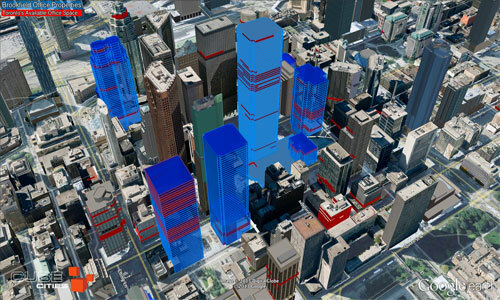 Before the arriving of Cube Cities it was not possible to fast visualize real estate data in 3D and now it became very effective for the real estate organizations. Cube Cities has changed the slow graphic of the real estate market and has brought a huge amount of interest for the common people. Reason to be in the real estate modeling industry: Though Cube Cities is a full time and evolved company in real estate industry but before it Greg had worked with a commercial real estate agency in a research capacity that gave him the experience. Working with the real estate agency gave him the experience of the sources of firm and maintaining the data, also provided with the information about the techniques by which generally brokers grasp the data of produce researches to make a good communication in trending markets. Everyone is knowledgeable about the nature of the commercial real estate; it is very competitive field and has so much high-quality challenging data, to overthrow this Greg and his team has a build a method. The method can help users to weight their data and offer them different complementary tools to build their own visualizations. This is a new and developed technology that can create thousands of floor-level building models quickly and help to connect with users and become a useful important 3D mapping technology. 3D modeling is best in the real estate modeling industry: Real estate field is all about the location and views that can leave an effect in the construction process and give the project a well and furnished look. As 3D modeling can highlight each and every detail clearly so by using it modelers can highlight the main parts of their model and give the model a lively look. Most challenging city model: Greg has designed many famous and big cities all around the world but according to him among them the most challenging and interesting model is Manhattan. This city is full of beauty in structures of every building; this city is consisted with various urban developments that give the city so much thickness that can’t find any other city. SketchUp has detailed the diversity in the buildings and made the iconic skyscrapers which are better than any procreated process. SktechUp is the only solution to create all kind of new and developed cities all over the world. Things that SketchUp solves in a city model: SketchUp gives its users the ability to use 3D buildings with perfect geometry and high-quality photographic textures in any application. It is not easy to get the right a3erial imagery for building photorealistic models though it allows using the camera kind of features everywhere. A team of SketchUp modelers maintains a good number of photographers in selected cities which help to create high-quality models in any content. Besides this, the Cube Cities’ team has also worked with Matterport; this software that helps to see inside a building and tour for examining the original conditions of a space. Matterport also make the Cube Cities technology a perfect way to join floors or windows of a SketchUp model to virtual tour. Future plans of Cube Cities: According to Greg, Cube Cities can be used to find indoor location or the location where the floor or partial area of a floor or other can be found. Besides that it can identify the problematic area or part of a building and solve them and provide public safety regulations also. In addition it is said that Greg is very much excited to see the combination and coordination of Cube Cities’ technology with SketchUp, Cesium and different mobile devices. All of them are different from each other but can become a huge versatile platform for the real estate industry. This sketchup video tutorial sheds light on the new design scopes by combining v-ray 3.6 and VR scans in sketchup. The tutorial is derived from a study of architecture interior and exterior project. The tutorial is conducted by Vessel Mikhaylov, a master degree holder from Technical University of Denmark. Vessel highlights some of the new and exciting features in v-ray 3.6 for sketchup. 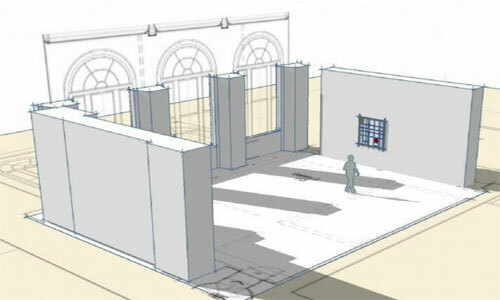 V-ray 3.6 for sketchup facilitates the users to render anything from rapid design model to most complicated 3d scenes. Rendering speed is very fast and one can design rapidly with the interactive rendering mode. Given below, some of the new features in v-ray 3.6 for sketchup. V-ray 3.6 contains a new lighting algorithm known as adaptive lights to accelerate the rendering process considerably particularly in scenes where there are lots of light sources. Lots of new materials and textures are included in this new version. The VR scan material is now supported and it allows to apply the curves groups scanned material technology in your project. Besides, there are various types of GPU rendering enhancements like the hybrid rendering system. Displacement in aerial perspective is also now supported on the GPU. Watch the following video tutorial to get more detail information. Wall thickness is necessary when you give your 3D model in print; otherwise, the 3D printer may not understand the thickness and thinness of the walls of your designs and print your model wrongly. 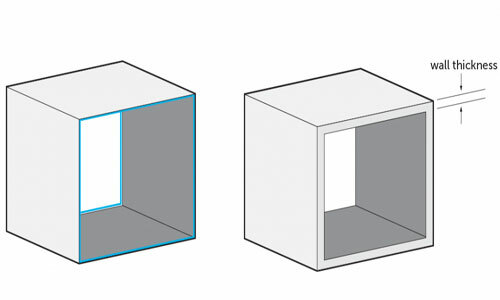 So, it is the unwritten rule of designing 3D model in SketchUp to add wall thickness to your design. Paper-thin surfaces are strictly avoided for 3D printable models. Setting the correct wall thickness needs your knowledge and proficient skills in designing. 3D printing materials and 3D models are two different subjects. The right wall thickness makes your 3D model print flawless, and it appears the same as you expect. 3D designing is an interesting field that grows rapidly in the world. This has made the craze for 3d printing materials used for various purposes. So, it is necessary to learn how to print a 3D model properly the way the design shows. 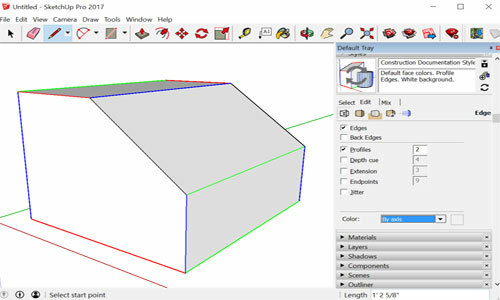 In the designing software, you no need to work on the thickness surfaces to make your model. But when it comes to printing, it is an obligatory thing to add wall thickness. It helps 3D printer understand how thick of the surfaces are and print accordingly. Wall thickness is defined as the distance between one surface and its opposite sheer surface. There are a few things that have an impact on choosing how much thickness you want for the surfaces. Materials would definitely come first in the list. The other factors that show a direct connection with the design are alignment, size and overall design. Printing materials play definitely an important role, and depending on which, you can opt for the minimum thickness of your wall. It needs a basic knowledge of different printing materials. If your design needs strong materials like high detailed stainless steel or titanium, you can keep your wall thickness indeed thick as the materials allow you to do so. The other factors are also there to watch on your 3D printing issue. Structure and design of your 3D models can be the decider of the wall thickness of the surfaces. For example, a print of vertical wall with 5mm2 wall surface needs 0.3mm wall thickness while a vertical wall with the 100mm2 wall surface needs 1mm thickness. If you are printing a horizontal wall with 100mm2 areas, then the wall thickness must be of 2mm. To set a proper wall thickness, you have to be correct while setting inputs like the size of the surface, the alignment (horizontal and vertical). The materials like ceramics which are fragile need different attention from the strong and hard materials. The larger the model is, the stronger the structure must be – this is considered to be the general rule while printing on the comparatively fragile surface. For example, the ceramic model of 50 mm x 50 mm x 50 mm needs a minimum thickness of 3mm. a ceramic object with 100 mm x 100 mm x 100 mm has 6mm thickness for printable. • It is common to give the primary attention on the wall with minimum thinness. But problems arise with the wall of maximum thickness. Thicker parts produce stress more than the thinner ones, resulting in a crack or break in the materials. • To avert breaks on your print, it is always recommended to have an extra thickness of 5mm wall. Your every design surface needs a recommended wall thickness to keep your model perfect for printing. It is an extraordinary process where you can visualize your virtual 3D models in real. So, having wall thickness is as much necessary as having a correct designing idea. Wisext released 3D Offset, the newest sketchup extension that is used to offset various faces at several distances. The users can now offset surfaces in 3D. The extension is compatible with SketchUp 8, SketchUp 2013, SketchUp 2014, SketchUp 2015, SketchUp 2016 and SketchUp 2017. In order to apply it, just press a single button to begin the tool. Choose or deselect the faces and put the distances segregated by “-“. Get the preview the offsetted faces. Press Enter to generate them. Now, go to window tab and click on default tray and check all the trays on the right hand side are selected. Watch the following video tutorial to get online demonstration of the extension. In this sketchup video tutorial, you will learn how to design your camper van in 3D by applying the free version of sketchup make 2017. The push pool tool & pencil tool in sketchup are used here for designing purpose. To make the measurement accurate, the measuring unit is transferred to millimeter. To do this, visit window tab and click on preferences menu. Now click on template and choose would work in millimeters template to keep all your dimensions in millimeter to avoid working inches and fractions. To learn the complete modeling process, go through the following video tutorial. After watching this tutorial, you will be able to create your own camper van by applying the methods provided in the video. Eneroth3 has developed Eneroth Flatten to Plane. This is the newest sketchup plugin available in extension warehouse. The plugin is compatible with SketchUp 2016, SketchUp 2017 and SketchUp 2018. It is useful for various industries like Architecture, Construction, Education, Engineering, Film & Stage, Gaming, Heavy Civil, Interior Design, Kitchen & Bath, Landscape Architecture, Urban Planning, Woodworking, Other etc. The plugin is used to flatten selected geometry to horizontal plane. It is ideal for imported DWGs where lines may contain various Z coordinates on what should have been a 2D drawing. Tim Killen has wrote a wonderful eBook on woodworking and the in every chapter of the book there is a modeling detail of a piece of furniture like table, window, door etc. 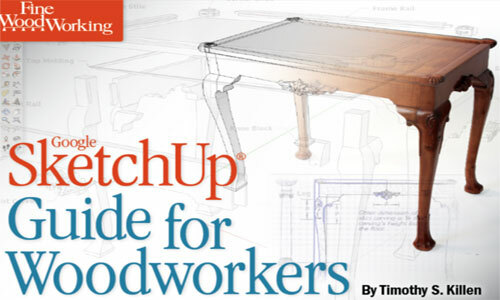 The book is named as “SketchUp Guide for Woodworkers” and the details are described there with tutorial videos and descriptions. In the ninth chapter of the eBook, Tim has described the process of creating a nice Chamfered Post Table; it is a 1700 model and is one of the famous pieces made by Wallace Nutting in his Book “Furniture Treasury”. Tim has named the chapter nine “How to Begin and Develop a piece of Furniture” in SketchUp which is a very good sample to start and grow the original woodworking used in workshops. Using SketchUp for modeling is actually a good idea as it will give a furnished draft of the original model which will be followed in time of original working in workshop. Tim’s eBook is full of detailed and understandable steps with many still pictures, texts and tutorial videos. In his ninth chapter he started making the Table from developing and sketching the main structures like legs, stretches, sides and backside etc. and all the four edges of the legs are unique here called chamfers. These unique chamfers are closed with a flat triangular finish which gives the legs a mix look of old and classic with uniqueness. In real without perfect planning or sketching, making these chamfers is not an easy job but in SketchUp, chamfers are started to making from one leg component and at last it ends by making all the four sharp and designed legs. Tim used various tools in SketchUp to give the chamfers their perfect look. Artisan Organic Toolset is the most recognized sketchup extension that now supports sketchup 2018. This sketchup plugin is available in different languages like Brazilian Portuguese, Chinese Simplified, English, French, German, Italian, Japanese, Russian, Spanish.